The fight isn’t over for U.S. Army Sgt. 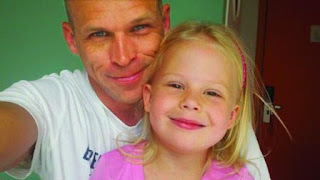 Jeff Chafin, who is seeking custody of his daughter, Eris, in an international dispute. The U.S. Supreme Court has ruled that Chafin’s case is not moot, though his daughter, now 6 years old, is in Scotland with her mother pursuant to a federal judge’s ruling under an international treaty. Chief Justice John G. Roberts Jr. wrote the unanimous opinion (PDF) for the court. The Hague Convention on the Civil Aspects of International Child Abduction generally requires U.S. courts to order children returned to their countries of habitual residence. A federal judge in Huntsville, Ala., had ruled that Eris Chafin’s habitual residence was in Scotland and ordered that she be returned there. Eris is now living with mother, Lynne Chafin, in Scotland. The Atlanta-based 11th U.S. Circuit Court of Appeals rejected Jeff Chafin’s appeal as moot last year. The U.S. Supreme Court reversed. “This dispute is still very much alive,” Roberts wrote. Justice Ruth Bader Ginsburg wrote a concurring opinion joined by Justices Antonin Scalia and Stephen G. Breyer that emphasized the need for speed and certainty in decisions under the treaty. This is very unusual for a federal court to stick up for a dad's child custody rights. Ginsburg argued for a new federal law limiting appeals, in order to limit the prolonged uncertainty of an international child custody case. I cannot agree with that. Maybe the courts should have expedited appeals instead. Ginsburg is just a judge, and she should only be opining on the judiciary, and not tell Congress what laws to pass. The problem here was that a bad federal judge declared Scotland to be the child's habitual residence, even tho the child had never lived there. Such a ruling ought to be appealable as judges should not have that much individual power. Ginsburg would rather not have to deal with any appeals, I guess. "A Scottish court is never going to return the child to the United States after this amount of time, because it couldn't possibly be good for the child," Cullen said in a telephone interview. "It would be complete madness for the Scottish court to say, OK, it's three years later, we'll send the child back." No, it is not madness. The mom is lucky that she is not in prison for kidnapping. Maybe the Scottish courts are so backwards that they let a woman keep a child if she has been kidnapped for 3 years, but the US courts should not turn their backs to the matter. Under the Hague Convention on the Civil Aspects of International Child Abduction, a parent whose child is abducted to another country can file a lawsuit in that country seeking to have the child returned to her home country, so that courts in that home country can resolve any custody disputes. In this case, a Scottish mother filed a lawsuit under the Convention in the United States, asking a federal trial court to order the child’s return to Scotland. When that court did so, the mother immediately left the United States for Scotland with her daughter. The issue before the Court was whether the child’s father could appeal the trial court’s order when his daughter had already returned to Scotland. The Court unanimously held that he could. All that is required for him to do so, the Court explained, is some real stake, even a small one, in the outcome of the case, and he has that: he is simply asking the intermediate appellate court to issue an order reversing the trial court’s ruling; he is also trying to have the trial court’s order requiring him to pay the mother’s attorney’s fees and expenses overturned. The appeals court must have had a severe anti-father bias. A lot of lawsuits are for money that is unlikely to be collected. A court is not allowed to dismiss a case just because some judge thinks that the losing party is unlikely to pay. Furthermore, it is crazy to say that this child should never see her dad just because he was in the Army and she did not see him for a couple of years. 1. the child and mother lived in scotland for more than a year while the father was deployed overseas. Not never, but it should be noted that they lived together in the US after the stay in scotland. 2. The mother was deported, the child stayed in the US with the father, the mother filed a hague action from Scotland and came over for the court hearing on a special visa and was allowed to return to Scotland with the child when the US federal judge ruled in her favor. 3. NOBODY is accusing the mom of kidnapping. The mother took the child to scotland AFTER a judge ruled in her favor in US federal court. The ruling was illegal retention in the US NOT kidnapping to Scotland. The mother and child went to Scotland with permission from the US federal court. Thanks for these corrections, and for bringing this decision to my attention. I am a big believer in joint custody, and this case is an extreme example where joint custody would be difficult or impossible. The mom's lawyer does argue that she would not comply with an American child custody order. That seems a lot like kidnapping to me. Also, even if the dad's ability to care for the child was limited by his Army obligations, I do not agree with permanently cutting him off from kid, as the courts have apparently done. You are so welcome. Glad to help. If you read or listen to the testimony Mr. Cullen gave to SCOTUS, his quote is out of context. When he says that the mother would not comply with a US court order, what he means is that she is under the control of Scottish courts and would ask Scottish courts for relief from any US "re-return" order. It would make for an interesting case if the US courts got irate and issued a kidnapping warrant. But both a return order and a kidnapping warrant would have to be processed through the scottish courts. So its not kidnapping, and honestly, US courts would do the same and ignore a re-return order that was 2 years after a foreign court gave permission and a favorable hague ruling to a parent who came to the US under such a ruling. The circuit court appeal is important because the Federal District Judge clearly just wanted the mom to have the daughter. She invented rules, twisted the treaty and the law, and frankly, denied a stay and allowed the mom to take the child because she knew the judgement was built on a faulty foundation. Its so wrong though as you wisely say ... joint custody is impossible. Its an ugly case. Its a warning to any service member, especially during wartime, to be careful who he/she has children with. The divorce rate among enlisted servicemen is high, higher when its a marriage to a non-citizen. Thanks. The purpose of the treaty is to prevent such a conflict between nations. I guess the mom is saying that she would try to create such a conflict in the Scottish courts, and then refuse to comply with the US court. Maybe so, but I think that the US court should presume that Scotland will comply with the treaty. Yes, it is a warning that the courts are broken. well, Chafin got the right to an appeal and the 11th circuit just told him ... we side with the mom and the lower court, the judge decided to trust the mom's testimony and we think that is fine. so its pretty much all over. its sort of sad they gave him hope and then strung him along for 2 years and took it away.